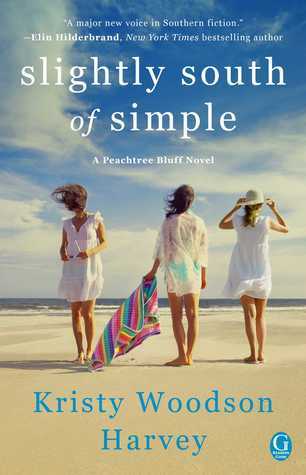 Goodreads: Caroline Murphy swore she’d never set foot back in the small Southern town of Peachtree Bluff; she was a New York girl born and bred and the worst day of her life was when, in the wake of her father’s death, her mother selfishly forced her to move—during her senior year of high school, no less—back to that hick-infested rat trap where she'd spent her childhood summers. But now that her marriage to a New York high society heir has fallen apart in a very public, very embarrassing fashion, a pregnant Caroline decides to escape the gossipmongers with her nine-year-old daughter and head home to her mother, Ansley. I love a good family drama and this one was right up there with my favorites. With alternating narratives by Caroline and then her mother the story moves forward at just the right pace. I would challenge any reader to get into it and then try to put it down! The sisters were just right. I loved how they interacted. I loved how you could see similarities and see that they were obviously raised in the same home, but still had personalities of their own. Caroline the main character of this book struck so close to home for me. There were quite a few moments where I took photos of the book and sent them to my mom and sister because Caroline said or did something that was so me! I love when I relate to a character it makes the reading so much better. There was a great delay in my reading this book and I am so thankful I was prompted to read it before I read its sequel. I am reviewing the sequel so come back tomorrow to check out what I thought about it.